On July 29, 1971, His Divine Grace A.C. Bhaktivedanta Swami Prabhupada delivered a lecture at the University of Florida in Gainesville. Speaking mostly to an audience of young college students, he addressed many popular misconceptions about the meaning and goal of yoga. Yoga, he said, was once understood as a complete, focused lifestyle meant to bring one to godly consciousness. In the ancient world, this meant a life of seclusion and austerity. Such yoga can't be practiced the same way in the modern world, yet the goal of yoga—union with the supreme—can be easily achieved by anyone, anywhere by the direct method of bhakti, devotional service; no sweat, Spandex, subscriptions, or expensive yoga mats required. 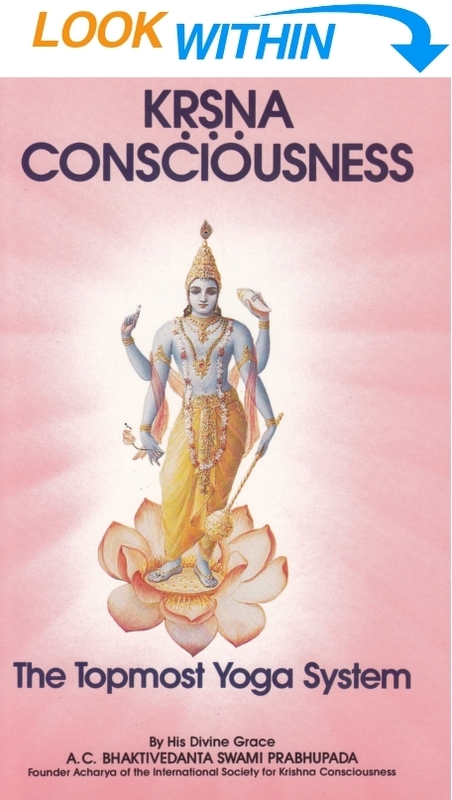 For anyone interested in yoga—academically, practically, spiritually, or otherwise—Krishna consciousness, the Topmost Yoga System is a concise and invigorating look at the history and purpose of genuine yoga, and the importance of bhakti for success in any kind of yoga. The Bhagavad-gita says that out of many thousands of human beings, one may try to make perfection of his life. Man is an animal, but he has one special prerogative, rational thought. What is that rational thought? Reasoning power, argument. Now, reasoning power is there in dogs and cats as well. Suppose a dog comes up to you; if you say, “Hut!” he’ll understand. The dog will understand that you don’t want him. So, he has some reasoning power. But what is the special reasoning power of the human being? As far as the bodily necessities are concerned, the reasoning power is there even in the animal. If a cat wants to steal some milk from your kitchen, she has very nice reasoning power: she is always looking to see when the master is out and she can take. So, for the four propensities of animal life—eating, sleeping, mating and defending—there is reasoning power even in beasts. Then, what is the special reasoning power of the human being, by which he is called the rational animal? Generally, the people are just like animals. They simply do not know anything beyond the necessities of the body: how to eat, how to sleep, how to mate and how to defend. And the Bhagavad-gita says, out of many thousands, someone may develop this reasoning power: “Why am I suffering?” He asks this question: “Why am I suffering?” We do not want to suffer, but suffering is forced upon us. We do not want too much cold, but too much cold and too much heat are forced upon us. When there is some impetus to awaken this reasoning power, it is called brahma jijnasa. This is found in the Vedanta-sutra. The first verse says that now, this human form of life is meant for asking the question of how to solve the problem of suffering. So Krishna says that this special prerogative of the human being is nut awakened very easily, except by some good association. Just as we have this Krishna conscious association. If we attain such association, where nice things are discussed, then that awakening of reason, that special prerogative of the human being, will come. As long as this question does not arise in one’s mind, he should understand that whatever activities he is doing will lead to his defeat. He is simply leading an animal life. But, not when these questions arise: Why am I suffering? What am I? Am I meant for suffering? Am I meant for troubles? I am undergoing troubles by nature’s laws, and by the state’s laws. So the question of freedom is how to become free from all these troubles. The Vedanta-sutra also says that the soul, my actual self, is by nature joyful. Yet, I am suffering. Lord Krishna further says that when these questions arise, gradually one comes to God. Those who have awakened to these questions are said to lie on the path of perfection. And, when the question of God and our relationship with God comes, that is our final perfection of life. Now, Krishna says that out of many thousands of people, one may try to make perfection of this life; and out of many millions of such persons on the path of perfection, only one may understand Krishna. So understanding Krishna is not very easy. But it is also the easiest. It is not easy, but at the same time it is the easiest. It is the easiest if you follow the prescribed forms. Lord Chaitanya Mahaprabhu has introduced this chanting of Hare Krishna. He has not exactly introduced it; it is in the scriptures. But He has especially propagated this formula. In this age this is the easiest method of self-realization. Simply chant Hare Krishna. It can be done by everyone. In my classroom, I am perhaps the only Indian. My students are all Americans, and they are taking part in the chanting very nicely, chanting and dancing. That means that, in any country, in any place, this can be performed. Therefore it is the easiest. You may not understand the philosophy of the Bhagavad-gita. That is also not very difficult; but still, if you think that you cannot understand, you can still chant very easily: Hare Krishna, Hare Krishna. If we want to understand God, Krishna, this is the beginning. The easiest beginning—simply chanting. Now, there are many students of my ISKCON institution. This institution is open a little over a year; but some of the students, by simply chanting, by the grace of Krishna, have advanced in such a way that they can talk about the science of God, and they will very easily answer those human questions. So, this is the easiest method of transcendental meditation. Krishna says that out of many millions of people, one may understand Him. But, by chanting of this Hare Krishna, as introduced by Lord Chaitanya—chanting and dancing—you can understand Krishna within a very short time. Knowledge begins not from Krishna, but from things which we are accustomed to see every day. Land is gross. If you touch it, you can feel its hardness. But, as soon as the land becomes still finer, it is water, and the touch is soft. And then again, from water to fire, still finer. After fire or electricity the air is still finer; and after air, the sky, ether, is finer still. Beyond ether, the mind is still finer; and beyond the mind, intelligence is still finer. And, if you go beyond intelligence to understand the soul, it is finer still. From these elements people have discovered so many sciences. There are many scientists, for example, who are soil experts; they can say, by analyzing a particular type of earth, what kind of minerals are there. Somebody seeks out silver, somebody seeks out gold, somebody seeks out mica. This is knowledge of gross things—the earth. If you go to finer substances, then you study water, or liquid things, such as petrol and alcohol. Go still finer, and from water you will go to fire and electricity. If you study electricity, you have to study all sorts of books. And, from this finer fire, you will come to air. We have so much advancement in our airplanes; we are studying how they move, how they are made—now sputniks and jets—so many things are being discovered. Next comes the study of the ethereal: electronics, ethereal transformations from one thing to another. Then, finer still, is the mind-psychology and psychiatry. But for intelligence, rationalism, there is only a little philosophical speculation. And what about the soul? Is there any science of the soul? The materialists have none. Material science has advanced to the study of the ether, or the mind and intelligence, but there is no advancement beyond that. Beyond intelligence, they do not know what exists. But here in the Bhagavad-gita you can find this. The Bhagavad-gita begins at the point after intelligence. When Arjuna was perplexed at the outset, his intelligence was perplexed—whether to fight or not to fight. Krishna begins the Gita from the point where intelligence fails. How does knowledge of the soul begin? It is just like a child is playing. You can understand this child’s body is now so small, but one day this child will be grown up, like you or me. But the same soul will continue. So, by intelligence, you can understand that although the body is changed, the soul is there. The same soul which was existing in the body of the child is still continuing in the body of the old man. Therefore the soul is permanent, and only the body has changed. This is a very easy thing to understand. And the last change of this body is death. As at every moment, every second, every day, every hour, the body is changing, so the last change is when one cannot act with the body, and so he has to take another one. Just as, when my cloth is too worn out or old, I cannot put it on; I have to take a new cloth. It is similar with the soul. When the body is too old or unworkable, I have to change to another body. This is called death. This is the beginning of the Bhagavad-gita, when the preliminary knowledge of the soul is there. And you will find that there are only a few who can understand the existence of the soul as permanent, and of the body as changeable. Therefore Bhagavan, Lord Krishna, says that, out of many, many millions of people, one may understand it. But still, the knowledge is there. If you want to understand it, it is not difficult. You can understand it. Now, we should inquire into the existence of the ego, the finest material substance. What is ego? I am pure soul, but with my intelligence and mind I am in contact with matter, and I have identified myself with matter. This is false ego. I am pure soul, but I am identifying falsely. For example, I am identifying with the land, thinking that I am Indian, or that I am American. This is called ahankara. Ahankara means the point where the pure soul touches matter. That junction is called ahankara. Ahankara is still finer than intelligence. Krishna says that these are the eight material elements: earth, water, fire, air, ether, mind, intelligence and false ego. False ego means false identification. Our nescient life has begun from this false identification—thinking that I am this matter, although I am seeing every day, at every moment, that I am not this matter. Soul is permanently existing, while matter is changing. This misconception, this illusion, is called ahankara, false ego. And your liberation means when you are out of this false ego. What is that status? Aham brahmasmi. I am Brahman, I am spirit. That is the beginning of liberation. Of course, one may be suffering from disease, from fever, and the temperature may come down to normal, 98.6 degrees. So he is now normal, but that is not the cure. Suppose for two days he has a 98.6 degree temperature, but with a slight change of diet, a slight change of behavior, the temperature rises immediately to 100. Relapse. Similarly, simply purifying the mind, rejecting this false ahankara identification—I am not this body, I am not this matter; I am soul—this is not liberation. It is only the beginning of liberation. If you stick to this point, and continue—just as you might continue your activities and keep your temperature at 98.6 degrees—then you are a healthy man. This is only a negative conception. When you actually realize yourself, simply understanding that you are Brahman will not do. You have to engage in the activities of Brahman. Otherwise you will fall down. Simply flying very high is no solution to the problem of going to the moon. Nowadays the fools are trying to go to the moon, but they simply go 240,000 miles up from the Earth, touch the moon, and return. They are very proud. There is so much talk of aeronautics: crowds and meetings and conferences. But what have they done? What are 240,000 miles in that vast sky? If you go 240 million miles, still you are limited. So this will not do. If you want to go high, you must have permanent shelter. If you can take rest there, then you cannot fall down. But if you have no rest, then you will have to fall down. The airplane goes high, seven miles, eight miles up from the earth, but it comes down immediately. So, simply understanding ahankara means no more than understanding the false identification. Simply understanding that I am not matter, I am soul, is not perfection. The impersonalist, the void philosopher, simply thinks of the negative, that I am not this matter, I am not this body. This will not stay. You have to not only realize that you are not matter, but you have to engage yourself in the spiritual world. And that spiritual world means to be working in Krishna consciousness. That spiritual world, that functioning of our real life, is Krishna consciousness. False ego I have already explained. It is neither matter nor spirit, but the junction—where the spirit soul comes into contact with matter and forgets himself. It is just as, in delirium, a man is diseased and his brain becomes puzzled, and gradually he forgets himself and becomes a madman. He is gradually forgetting. So there is the beginning of loss, and there is one point where he forgets. That beginning point is called ahankara, or false ego. Chanting the maha-mantra—Hare Krishna, Hare Krishna, Krishna Krishna, Hare Hare/ Hare Rama, Hare Rama, Rama Rama, Hare Hare—is the process not merely of putting an end to this false conception of the self, but it goes beyond that, to the point where the pure spirit soul engages in his eternal, blissful, all-knowing activities in the loving service of God. This is the height of conscious development, the ultimate goal of all living entities now evolving through the cycles and species of material nature. There are many different types of yoga. Yoga means the system, and Yogi means the person who practices the system. The object of yoga, the ultimate goal, is to understand Krishna. There, Krishna consciousness means to practice the topmost type of yoga. This topmost yoga systems was described by Krishna in the Bhagavad-gita to his most intimate friend Arjuna, and Srila Prabhupada expands this idea here for the benefit of society at large.